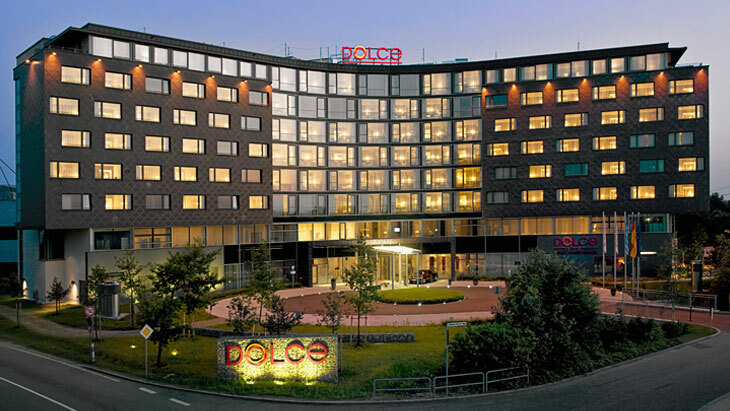 Dolce Munich in Unterschleißheim aims to build bridges: between business and relaxation. The hotel combines the world of conferences and events in its BallhausForum conference centre with the benefits of a private holiday for relaxation and recuperation. The location in close proximity to the Bavarian capital entices guests to take trips into Munich or attend events in the nearby Allianz arena. The many attractions offered by Upper Bavaria are right on the doorstep. Opened in April 2010, the hotel embodies the latest trend: business meets wellbeing. From the bar with an open fireplace to elegant suites: an all-round cosy atmosphere is the key ingredient in the recipe for wellbeing. A helping of country house style with furnishings characterised by solid wood, animal furs and Bavarian cow bells meets a modern lifestyle. At Dolce Munich, this includes high-quality gastronomy and the Dolce VitalSpa for pure relaxation. The spa area entices guests with its pool, cosmetic treatments and multiple saunas. The individual sense of wellbeing is also felt in the 255 rooms and suites. To this end, the bathrooms furnishings include the Raindance Showerpipe 180 and the Metris S mixer from Hansgrohe.